Only four out of the 12 rods here have fished at Middle Camp before and after their first day settling in they set off with enthusiasm yesterday to explore more of the masses of river available to them. The water height remains perfect for getting the jet boats about so Sergei took Hugh and Jamie up Yovas rapids to see if Jamie G could get his first salmon. 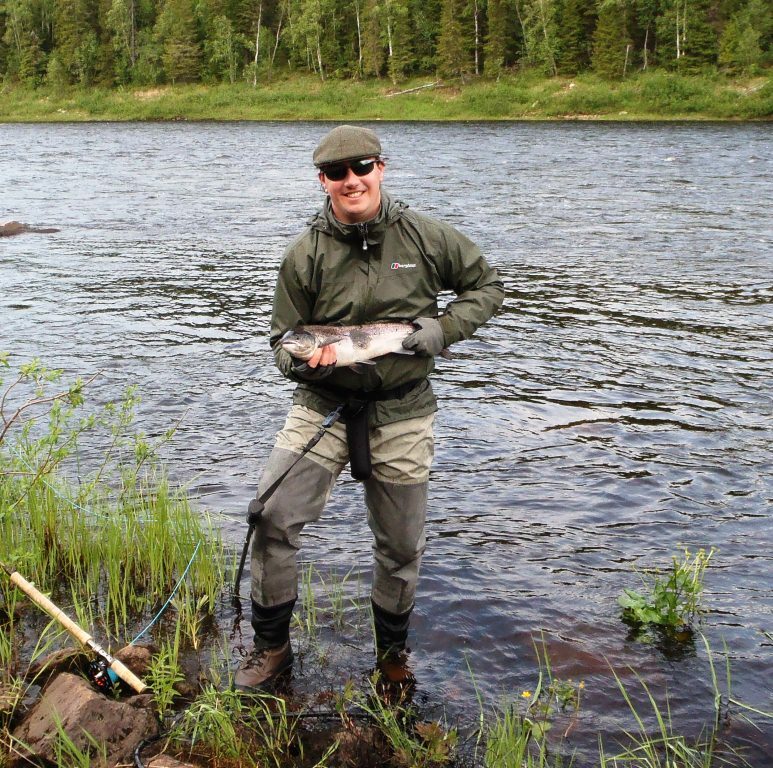 Sure enough Jamie landed two in the morning, from Dunkery Run and Deeside, and Hugh put up the Union Flag on the boat in celebration. In fact the celebrations ran well into last night and breakfast this morning was rather later and quieter than normal! I try, every evening after dinner, to take a boat out with a couple of guests for an hour or so; it has become a bit of a routine and one I much enjoy. Generally I take one of our larger boats, 19 feet and with a wide, flat plywood floor. 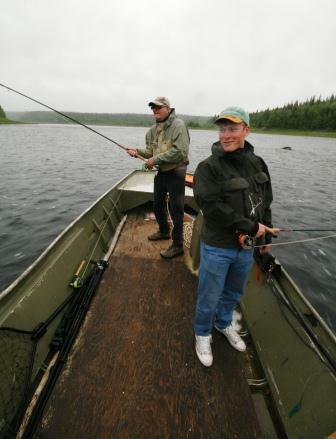 A very stable and comfortable platform to fish from and with the advantage that no waders are required; the guests simply grab their rods and a jacket and jump in. 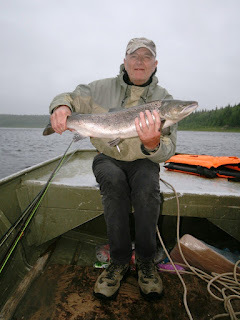 It is a wonderful way to spend an evening hour, the light can be extraordinary – more so as we approach mid-summer – it is totally peaceful and quiet and the casting easier without the hassle of wading. It took five minutes to the top of Generator where some fish were splashing through and in the hour James F had two really good fish to the net to take his tally for the day to five. We always have the option to put a guest into a boat to fish, some prefer to wade while others, particularly those of more advanced years, like a combination of wading in the easier places and fishing from a boat if tired or where the wading is more tricky. 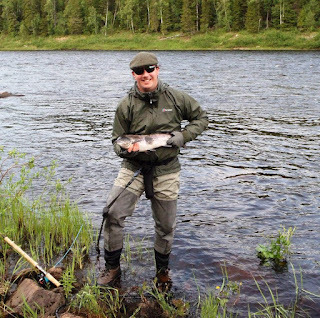 I also like to take beginners in the boat to settle them into fishing for salmon – the casting is much easier, they can see what the line and fly is doing and can really concentrate on learning how to fish the fly in a salmon tempting swing. Pana reported 68 salmon landed on Sunday and 63 yesterday and on Kitza our Spanish team had 36 yesterday before celebrating their win over Croatia. ﻿We had some rain last night and this morning is rather mournful with a low, damp mist. The rods have gone out, some with sore heads, particularly the younger members of the party who quite predictably ended up around the kitchen table last night with the younger Russian guides. Great to see the bonding going on - I suspect it will be an early night for some this evening!